The rollout of the U.N. Intergovernmental Panel on Climate Change's fifth assessment report was met with a number of irresponsible and downright ridiculous media claims, all of which attempted to cast doubt on the harsh truths the report delivered about man-made climate change. The biggest offender in the media circus? Perhaps not surprisingly, it was Fox News. What should be shocking, though, is just how much doubt that one network managed to sow. Throughout August and September, according to a new analysis from Media Matters, 69 percent of the guests featured on Fox News were climate skeptics. A full three-quarters of the time climate change was mentioned on the network, it was done so in a way that questioned its legitimacy. The above chart shows how out-of-touch Fox News is with the overwhelming consensus of climate scientists. 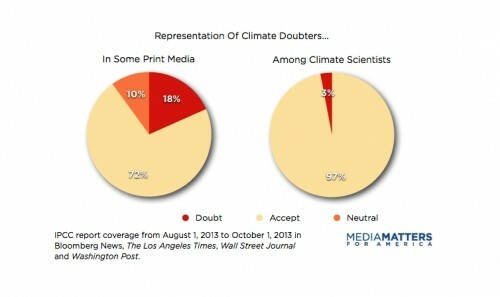 As Mother Jones points out, the network overrepresented deniers by a factor of 23. CBS gets a special mention, too, for overrepresenting climate deniers. According to Media Matters, skeptics monopolized 20 percent of the network's coverage.